Dock Hardware | Post Dock Hardware for 1-1/4" Pipe | VE-VE Inc.
Home :: POST Dock Brackets ( #5 ) :: ( #4 ) D-600 Series; "POST DOCK BRACKETS" For 1-1/4" dock pipe ( 1-5/8" O.D. ). D-600 Series; "POST DOCK BRACKETS" For 1-1/4" dock pipe ( 1-5/8" O.D. ).pipe. A & B = D-600; 1 pr. Telescoping Straight Brackets (B) & 1 pr. Section Connectors (A) for 1-1/4" pipe only ( 1-5/8" O.D. ). B = D-615; 1 pr. Telescoping Straight Brackets, For 1-1/4" pipe only ( 1-5/8" O.D.). D-620; 12" Sq. "Base Pad" ( For 1-1/4" Pipe. ( 1-5/8" O.D.)). "Base Pad" has a 12” square base and adjustable sleeve to mount 1-1/4" Pipe. ( 1/2" adjustment bolt included ). Hole in center of pad allows pipe to go through for extra dock support if desired. Usually used 2 ea. per dock section. D-630; "Dock Stabilizer Kit" for 3 ft. (36”) to 4 ft. (48”) wide docks with 1-1/4" dock pipe ( 1-5/8" O.D.). Stabilizer bar helps to reduce a docks side to side racking/swaying. U-shapped design mounting brackets allow brackets to be mounted on dock pipes allready fastened to dock. ( DOES NOT need to be slid over from the top of the pipe ). Includes: 1ea. 53" Brace Bar, 2ea. End Mount Brackets & Fasteners. D-630-80; "Dock Stabilizer Kit" NOTE: This is NOT for 4' wide docks!! 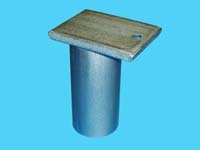 It is for docks WIDER then 4 ft. & up to 6 ft. (72”) wide, with 1-1/4" dock pipe ( 1-5/8" O.D.). Stabilizer bar helps to reduce a docks side to side racking/swaying. U-shapped design mounting brackets allow brackets to be mounted on dock pipes allready fastened to dock. ( DOES NOT need to be slid over from the top of the pipe ). Includes: 1ea. 80" Brace Bar, 2ea. End Mount Brackets & Fasteners. (4 ea.) 5/16”-18 x 2-1/2”; Galvanized Carriage Bolts. (4 ea.) 5/16”-18; Galvanized Hex Nuts. (4 ea.) 5/16”; Galvanized Washers. 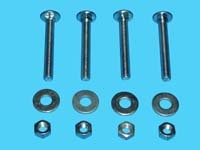 D-462; "Dock Fastener Kit ( Bulk Pkg. )" 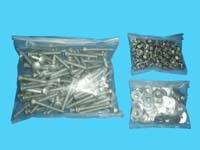 "DOCK FASTENER KIT (Bulk Pkg.)" (100 ea.) 5/16”-18 x 2-1/2”; Galvanized Carriage Bolts. (100 ea.) 5/16”-18; Galvanized Hex Nuts. (100 ea.) 5/16”; Galvanized Washers. D-54; Vinyl Cap. ( For 1-1/4" pipe. ( 1-5/8" O.D. )). The "Pipe Cap" fits over 1-1/4" dock pipe that is 1-5/8" O.D. These round injection molded pipe caps are made with marine grade vinyle and fit snuggly over the top of the pipe for a safe and attractive finish. ( Color is White ). NOTE: BECAUSE OF LOW INVENTORY AT THIS TIME, PIPE CAPS WILL ONLY BE SOLD ALONG WITH A DOCK BRACKET ORDER, SORRY!! Shipping is FREE when ordered with a dock bracket order!!! D-593; "Pipe Driving Cap" ( For 1-1/4", 1-1/2" & 2" pipe ). 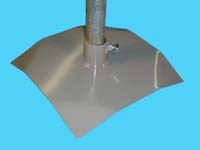 "Pipe Driving Cap" helps protect top of pipe when driving pipe into lake bottom. 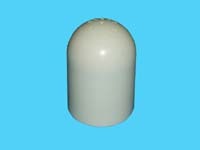 Cap fits over 1-1/4" Pipe (1-5/8" O.D. ), 1-1/2" Pipe (1-7/8" O.D.) & 2" Pipe (2-3/8" O.D.). Hole provided to tie optional retrieving rope and place other end over pipe. NOTE: THIS ITEM SUBECT TO $14.50 MINIMUM SHIPPING CHARGE. IF TOTAL ORDER SHIPPING CHARGES DO NOT ACHIEVE MINUMUM.